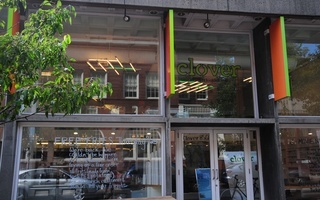 After five days without Chickpea Fritters or BBQ Seitan, vegetarian eatery Clover Food Lab opened their new Harvard Square location early Tuesday afternoon for the first time since closing their former storefront last week. The restaurant closed its doors last Thursday and originally planned to open its new location last Friday, according to Clover Founder and CEO Ayr Muir. However, construction and inspection delays pushed the opening to Tuesday. Patrons wait in line at Clover’s new location in Harvard Square. 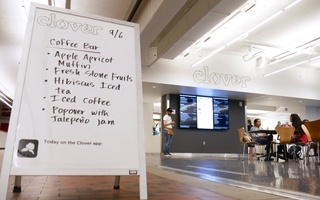 Clover’s relocation comes after the restaurant was forced to move out of their Smith Campus Center storefront due to renovations slated to last until the spring of 2018. 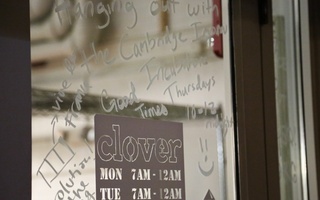 Although Clover faced uncertainty in finding a new location in Harvard Square, the company was able to lease a storefront just a few steps away at 1326 Mass. Ave.—formerly home to Szechuan-style Chinese restaurant Yenching. “I really didn’t want to be in the other side of the Square. We established ourselves here and now we’re even closer to the Yard.” Muir said. Although the new space is considerably smaller than the former location, Clover was able to keep its large community table and also install new booths along the sides. The new location has a modern feel, with a full glass storefront, large windows, and LCD screens displaying the menu. 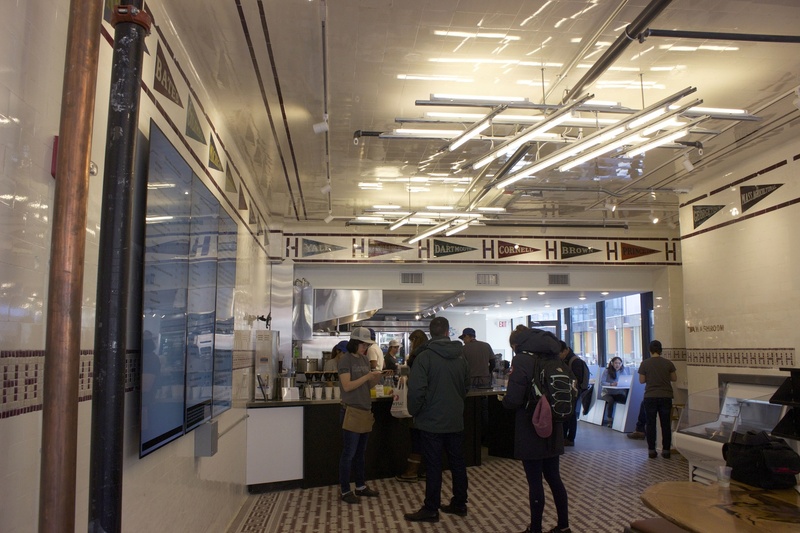 However, one standout feature of the new restaurant predates Clover itself—the walls of the new store are covered with tile pennants of schools including Harvard that were discovered during demolition according to Muir. 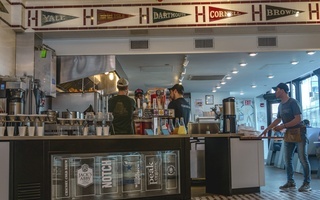 Other schools with their flags along the top edge of the walls include the University of Michigan and the now-defunct Harvard football rival Carlisle Indian Industrial, which was a federally funded boarding school for Native Americans until its closing in 1918. Muir said the tiles inspired him to do some research at the Cambridge Historical Society in the hopes of finding out what occupied the restaurant during the early 1900s. To Muir’s surprise, he discovered the restaurant used to be home to two of Cambridge’s main cafeterias. The first was the Waldorf Lunch Place, followed by the Hayes-Bickford. According to Clover Director of Communications Lucia Jazayeri, the Waldorf Lunch was an important meeting space for both students and laborers in the early 1900s when Cambridge was a more blue collar town. Later on in the same location, Hayes-Bickford was the site of several major meetings during the civil rights movement, Jayerzi said. Students said they were pleased with the renovation, especially Clover’s decision to restore the tiles. 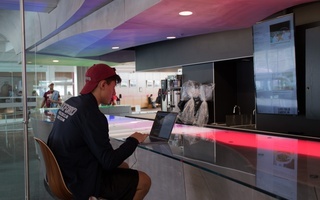 —Staff writer Junina Furigay can be reached at junina.furigay@thecrimson.com. Follow her on twitter @junina_furigay.